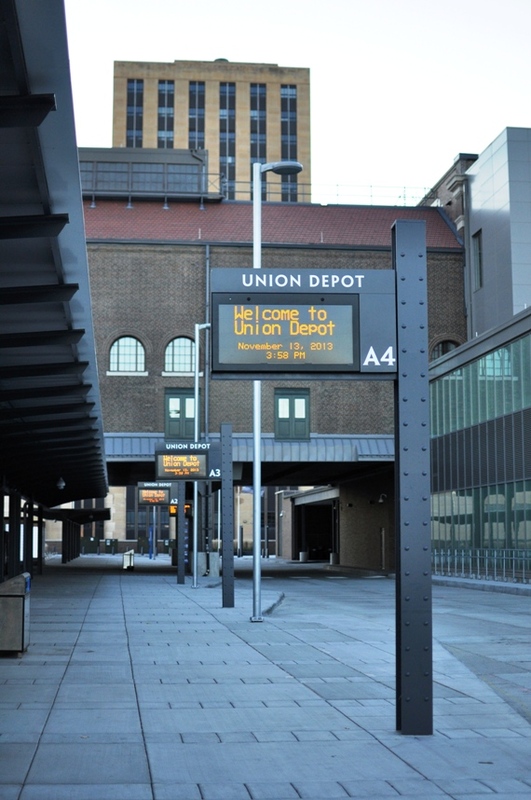 Description: Union Depot sits in the heart of St. Paul’s Historic Lowertown neighborhood. The building opened in 1926 and served as a hub for passenger trains until 1971. Owned by the Ramsey County Regional Railroad Authority, the facility underwent a $243 million renovation that was completed in December 2012. Today, Union Depot is a multi-modal transportation hub. Metro Transit and Minnesota Valley Transit Authority buses make stops at the Union Depot Transit Center, on the south side of Union Depot. The METRO Green Line's Union Depot Station sits north of the building. Amtrak, Jefferson Lines, Greyhound and megabus.com also serve Union Depot. Union Depot also includes event space, bike and parking facilities and dining. The building has received a LEED Gold certification from the U.S. Green Building Council. Routes 63, 70, 350, 351, 361 and 364 stop just east of the Union Depot, at the corner of Kellogg Boulevard and Broadway Street. Safety and security: The facility is well-lit and equipped with security cameras. Security officers also monitor the site. Bicycle and pedestrian connection: Outdoor bike racks are located at the bus platform and on the north plaza near the Green Line's Union Depot Station. Indoor bike storage facilities are available (e-mail info@uniondepot.org for information). There is also a Nice Ride kiosk, access to the Bruce Vento Regional Trail between Lowertown and the Bruce Vento Nature Sanctuary and off-road trails on the Mississippi River. Union Depot is connected to the St. Paul skyway system. St. Paul Saints: The Saints ballpark, CHS Field, is located just blocks from Union Depot Transit Center. To reach the stadium from the transit center, enter Union Depot and go up one level. Exit the north side of the building and head east on 4th Street East to Broadway.